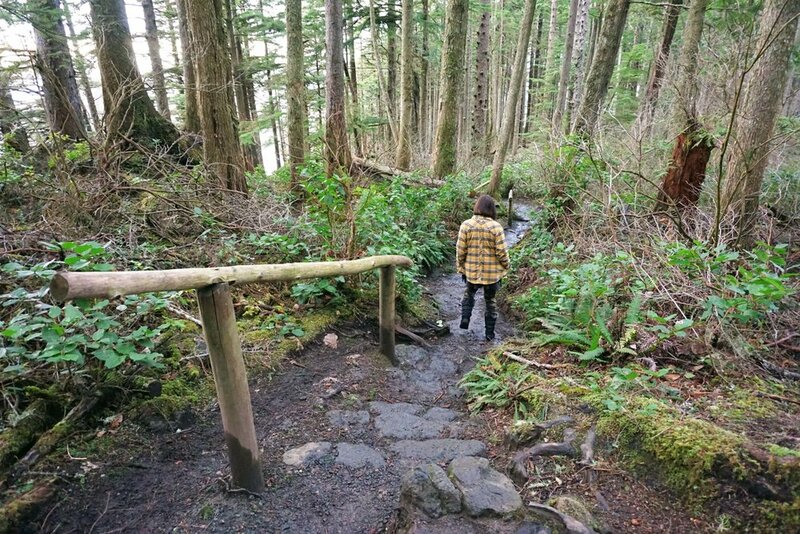 A short hike through the woods of the Makah Reservation brought us to one of the furthest reaching points in the country. 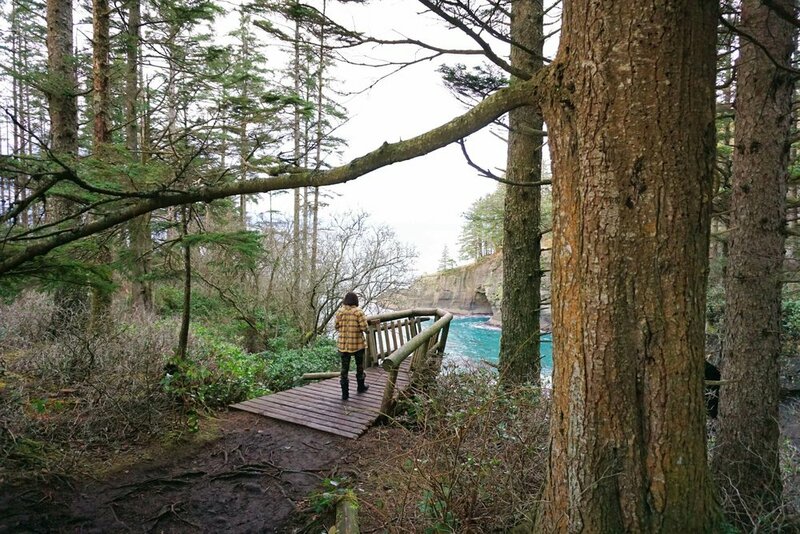 Cape Flattery Trail consists of boardwalks, educational signage, and short spur trails leading to cliff views. 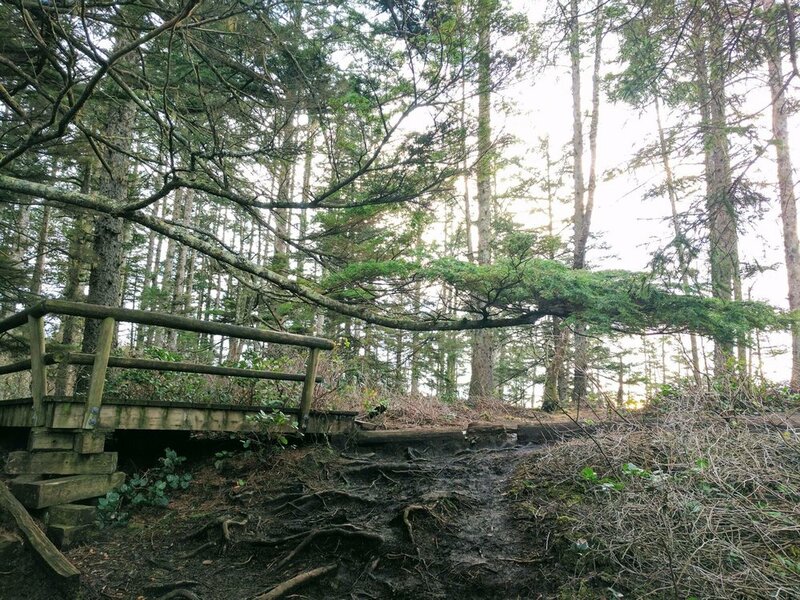 At the end of the trail, we were greeted with an observation deck which provided spectacular scenes of the Pacific Ocean, Tatoosh Island and its lighthouse, and the rocky shores directly below. 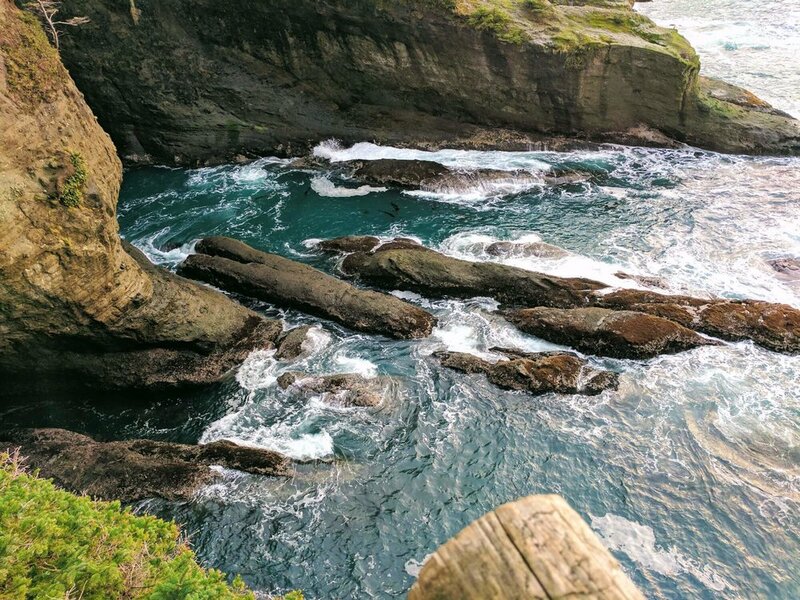 Though the drive is long for most, Cape Flattery is a beautiful Pacific Northwest gem that everyone should visit at least once. On March 22, 1778, Captain James Cook, during his journey to seek out the Northwest Passage, reached this rocky, cliffy area. He wrote in his journal, "a small opening which flattered us with the hopes of finding an [sic] harbour." 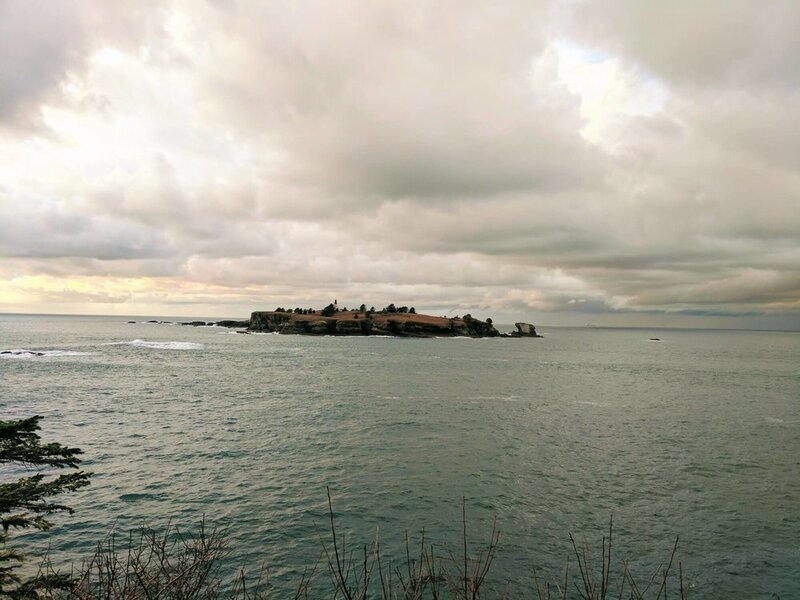 He afterward named this opening Cape Flattery. There was some confusion later on as to which area Cook was referring. Captain George Vancouver, who initially sailed with him, cleared this confusion on a subsequent return in 1792. Vancouver named the rocks near Cape Alava as Flattery Rocks and called the entrance point to the Strait of Juan de Fuca as Cape Flattery. 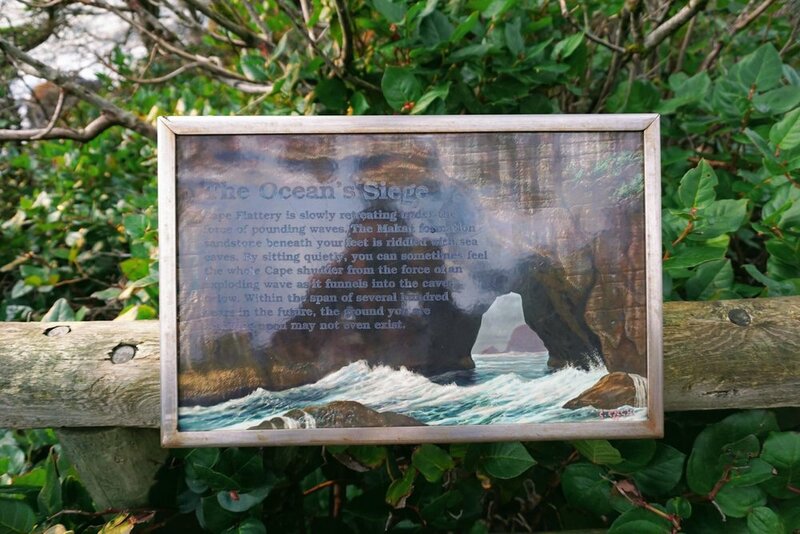 Today, Cape Flattery is the oldest non-Indian named feature in the state of Washington. It is also a popular photo location on Instagram. During our drive, the sky was cloudy and the day filled with rain. Luckily for us, as we were approaching the reservation, the rain stopped and a break in the clouds began to let the blue hues hiding behind them shine through. We stopped off at the Washburn General Store in Neah Bay to purchase a yearly Makah Recreation Permit for $10. This permit is needed to park anywhere on the land. We also used a public restroom facility located next to the parking lot. The remainder of the drive to the trailhead was about 18 minutes. We started the short 3/4 mile hike through sparse woods with orange sunbeams striking through. The trees here are interesting and eerie. Twisted and knobby, faces and figures seem to be all around, like ancient beings turned to wood. A good portion of the trail consisted of boardwalks, which was reminiscent of the nearby Shi Shi Beach Trail we hiked over a year before this. Our current trail descended the whole way. It is not terribly steep, but do keep in mind that the walk back is all uphill. There was one large downed tree which we successfully climbed over. It was nothing of great consequence. Along the route, there are a few spur trails that lead out to cliffsides. 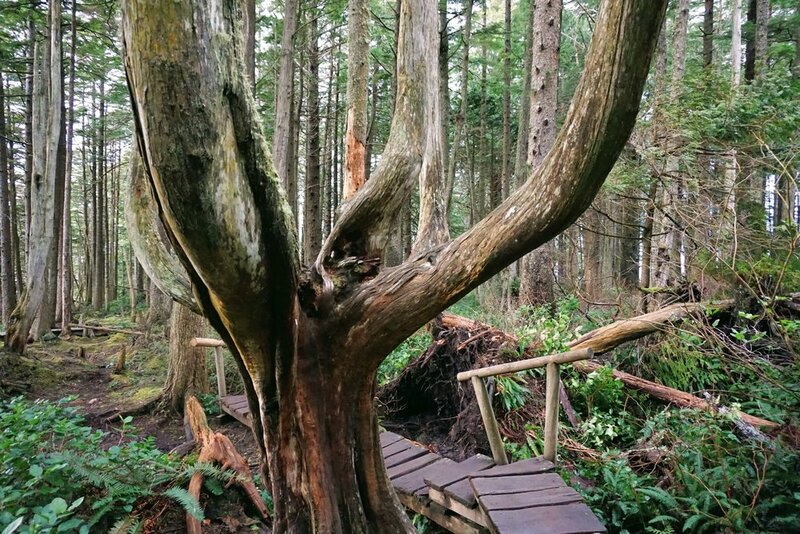 Some of these trails have observation decks, and some do not. Be careful; it is a long way down! As we arrived at the end of the trail, where the main observation deck was, there was quite a group of people already there, making it difficult to take photos. Some were on the deck, while others were below it on the edge of the cliff. A couple of them had set up their tripods and were staying put. We tried our best to get what photos we could. As we glanced down, waves crashed into the many rocks below us, then swirled and gushed their way into small nearby caves. We looked west, the sun was peeking through the clouds and casting a vivid orange reflection onto the water. Straight ahead of us was Tatoosh Island with the visible Cape Flattery Light sending out its beacon to warn those of the troubles in which Captain James Cook once found himself. Behind us, to the northeast, were more caves below with the sea rushing into their dark and mysterious voids. It was an incredible scene. Although many other people were there, everyone was quiet and polite. It was a relaxing, calming, and inspiring time in which we all seemed to recognize the great beauty that our world provides from sunrise to sunset. It was a moment to forget about the world behind us and just appreciate the far-reaching edges of it before us. We were pressed for time and didn't watch the sun fully set over the horizon. Certainly, it would have been a spectacular sight, but we had a destination in Forks to reach by 7:30 pm. We jogged back to the parking lot, and working up a sweat; we realized it was a bit steeper than we thought. As we drove out of the reservation the sunlight was fading fast, the clouds had rolled back in, and the raindrops began to fall once again. We had our golden hour; it was palpable, magnificent. Hey, we appreciate your readership! If you're in the market for new gear and would be willing to make your purchase through our Amazon link, we might get a small commission out of it. No additional cost to you and maybe a little something for us! 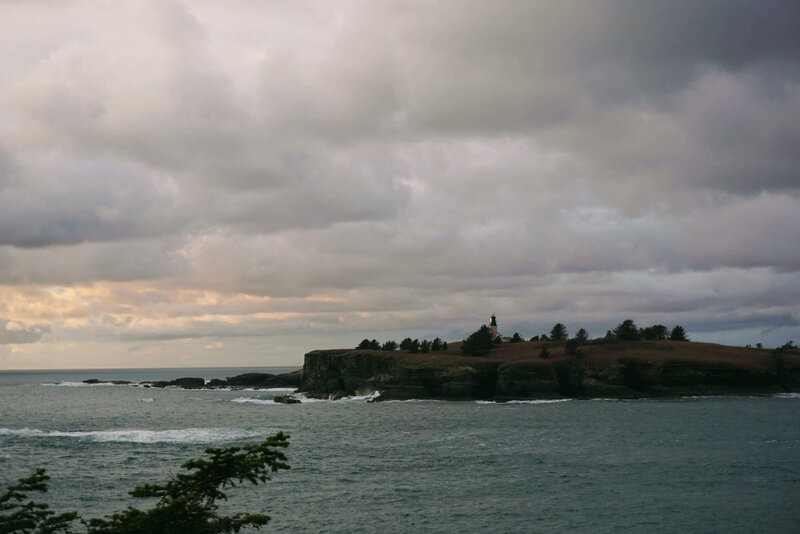 Follow along on our wanderings around the Pacific Northwest. The only thing better would be being there yourself! ©2019 Pacific North Wanderers. All Rights Reserved.